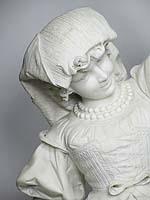 A Fine Italian 19th/20th Century Carved Carrara Marble Sculpture of a Dancing Young Titled "Ciociara" by Ferdinando Vichi (Italian, 19th Century) Depicting a young Italian peasant dancing the Tarantella. Signed: F. Vichi. Circa: Florence, 1900. Ferdinando Vichi was part of the talented band of Tuscan sculptors associated with the Bazzanti Gallery in Florence, Italy. His compositions are varied in subject matter, ranging from Romantic busts, women and children to orientalist themes and Renaissance-inspired models. 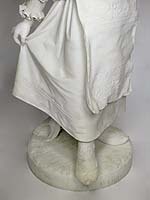 Like many other late nineteenth-century sculptors, Vichi often took inspiration from Romantic and Tender subjects. 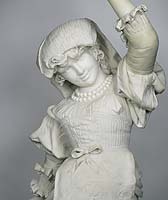 A Fine Italian 19th/20th Century Carved Carrara Marble Sculpture of a Dancing Young Titled "Ciociara" by Ferdinando Vichi (Italian, 19th Century) Depicting a young Italian peasant dancing the Tarantella. Signed: F. Vichi. Circa: Florence, 1900. 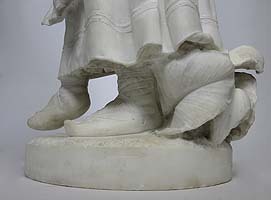 Ferdinando Vichi was part of the talented band of Tuscan sculptors associated with the Bazzanti Gallery in Florence, Italy. His compositions are varied in subject matter, ranging from Romantic busts, women and children to orientalist themes and Renaissance-inspired models. 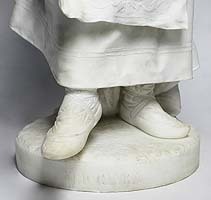 Like many other late nineteenth-century sculptors, Vichi often took inspiration from Romantic and Tender subjects.